Jet lag is a bummer. But it can have a silver lining — you can add meals at the oddest time of the day or night and have a perfectly good excuse to indulge… Here’s one of my nearly instant midnight snacks in our little rented Parisian flat (finding this kind of food at midnight in a snazzy hotel is a little harder to do). Take out three bags of different types of pre-washed salad greens from the fridge and pile some onto a plate. Add some sliced golden apples for flavor and texture. Dress with some bottled Maille Vinaigrette. Yup, bottled grocery purchased salad dressing. I don’t often buy salad dressing, but this is one of the best I have ever purchased. 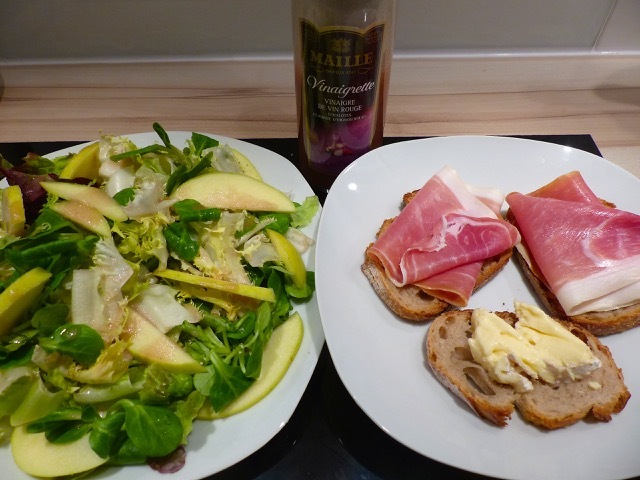 I liked it so much (good red wine vinegar, obviously some maille mustard and just the right balance of salt and other seasonings), I wanted to bring a few dozen bottles of salad dressing home! A few slices of bread, some slices of jambon or ham and a shmear of brie (or was it camembert?) and I was one happy camper. It’s hard to go back to sleep right after this midnight snack, but at least there’s no risk of getting hungry before a proper breakfast. I believe camembert is more yellowish than brie and also more gooey. Oh boy. I’d think the fun of eating that in the dead of night all by oneself would just add to the deliciousness! @ Shiko-chan: Recently I brought home a (glass)bottled pumpkin oil wrapped in bubble wrap, placed inside a resealable plastic bag then rolled lumpia style with a thick shirt inside our checked- in luggage. No breakage or leak. :) it survived the almost 16 hour flight! nothing better to remind you that you’re in paris! Joyce Aragon’s dulong and Claude Tayag’s or Milky Way’s taba ng talangka are worth the risk of ”smuggling” them into the Netherlands. In addition to placing them in bubble wrap a la Betchay and taping them around the lid a la Denise, I then put the bottles inside a plastic bag and knot the bag securely – and then in yet another plastic bag securely knotted. Has worked so far, fingers crossed. Who Invented the Incendiary BICOL EXPRESS?